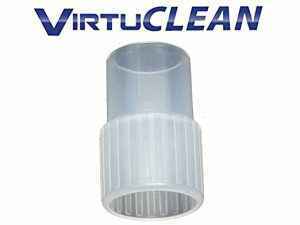 VirtuClean CPAP cleaner is a device that is very compact and easy to use. It does not require any work on your part. This cleaner uses the power of ozone along with other various VirtuClean brand sanitizers to rid your mask and humidifier of any germs or bacteria that may have grown inside of them. The best part about this is that it takes no longer than 30 minutes. It is very important to keep your CPAP equipment clean as two of the most common side effects are congestion and nasal dryness. This can alter how well your CPAP works for you. There are ways to prevent these issues, however. Replacing your tube with a heated tube can be very beneficial. everything to the cleaner. Having a heated tube can take your CPAP machine to a whole different level. It is an extension of what your humidifier already does, it helps to moisten the air within your mask to match the outside atmosphere that the humidifier heats up during the night. A difference in temperature between the regular tubing and the warmer air surrounding it can lead to condensation and also an event named “rainout”. Water can condensate within your mask along with other parts of your machine, both internally and externally, leading to wet sheets and clothes. With a heated tube, everything is kept at a reasonable temperature so rainout cannot occur. Nearly all CPAP machines today are compatible with heated tubing. You may need to modify some things, such as the humidifier, but for most, it should be an easy switch. Cleaning the tube is all too easy. adapter to the hose, the other end to the cleaner, and let it run for 30 minutes. After your mask is done, disconnect the hose and attach it to your empty humidifier. Let it run for 30 more minutes, and you are complete. Cleaning Non-Heated Tubing is the exact same process, just without the adapter. How often do I Clean Everything? It is recommended that you clean your equipment daily. If bacteria and mold begin to grow, it can get out of hand very quickly and make you ill very quickly. No solutions, soap, water, nothing is necessary except a lithium battery to run the cleaner and your equipment. The battery is very light and able to be transported easily. The lithium ion battery is rechargeable and is said to last about 10 years. VirtuClean CPAP cleaner is one of the most trusted on the market today.